Go to 'Account' => 'Settings' => 'Cancel Account'. By clicking 'cancel account permanently' all data stored will be deleted irrevocably. You only have the option to cancel the account if you are an admin. 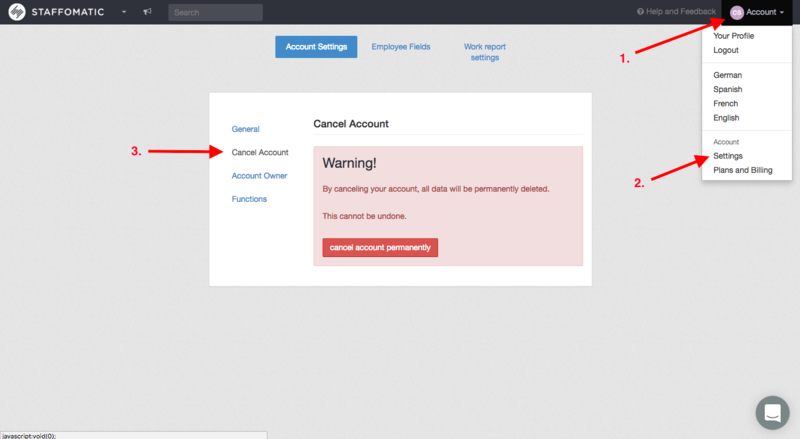 Employees need to contact the account owner to have their profiles deleted. If you do not delete the account it will remain in force and you can activate it again in the future. However this only applies to the testing phase. Once you have chosen a plan you will have to pay the invoices or completely delete the account.